A Catch that Beat the Guys! We all know there are plenty of fishermen out there. But let’s talk about the fisherwomen! 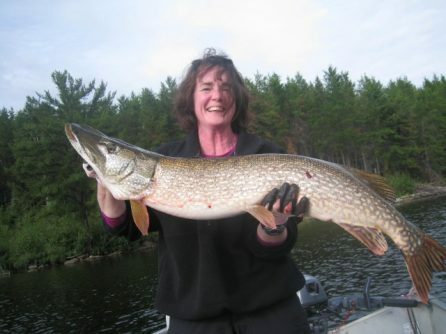 During her stay at Malaher Lake, Colleen Quinn released this beautiful 42 inch Northern on an Erie Dearie tipped with a salted minnow. Colleen also told us that she can’t believe how long its been since her trip, which went by much too quickly. “This one [the Northern] is big enough for me to think about having a reproduction made for our lake cabin, so I’ll be able to relive the moment in my memories,” she said. We’re glad you had such a wonderful trip, Colleen. Congratulations on your catch, and we look forward to seeing you next year!